Now much saliva do you have on your tongue – why? Because we have 10 books of Green Shield Stamps to fill up in the drawer and we need to get nan a present! All sound familiar? Well if you grew up in the 60’s or 70s you may remember the Green Shield Stamps. Popular in the UK and founded in 1958, shoppers collected the green coloured stickers in a book. The filled books could later be exchanged for a range of household goods such as household items, garden furniture and toys. Green Shield Stamps founded by Granville Richard Francis Tompkins, were more often found in smaller shops in the early sixties. 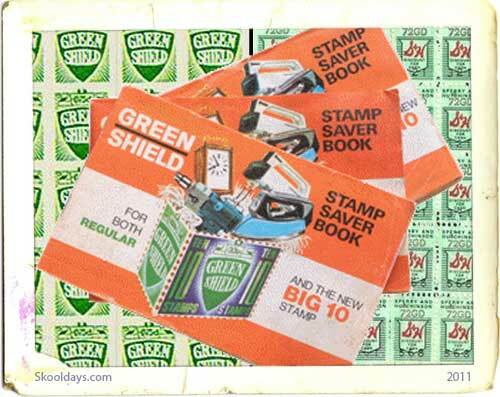 Local grocers, butchers, greengrocers, fishmongers, chemists, bakers, tobacconists, confectioners, drapers, ironmongers and petrol stations all gave Green Shield Stamps out as a type of promotion hook. Later in the sixties, big stores such as Tesco signed up the scheme. For the retailer it was a way of encouraging customer loyalty, today of course they all have there own club cards and in effect an electronic form with a swipe of a card has now superseded the saliva quenching activity. In the USA there were known as Pinky Stamps. Similar to the UK, S&H Green Stamps were ‘trading stamps’ that were very popular from the 1960s and 1970s. Basically customers would receive the stamps at participating retail outlets like grocery stores and gas stations. The more you bought, the more stamps they gave you. The stamps could later be redeemed for products in the S&H Green Stamps catalogue. Which came first UK or USA? For the customer it meant free gifts. The biggest irony was the gifts had to be paid for. It was the retailer who paid the stamp company. He may have passed on those costs to the customer, but Which? in 1965 found prices no higher in stores that gave away stamps. So it wasn’t as good as it sounded! Richard Tompkins, who brought Green Shield Stamps to the UK, launched the Argos Catalogue Showroom as a spin-off in 1973. Green Shield Stamps were less popular in the later 70s. Competition from the new supermarket, Kwik Save, made Tesco stop giving away stamps and concentrate on value. Customers realised that they were ultimately paying for the gifts and chose cheaper prices. Meanwhile Argos continued to grow into a massive catalogue store which is still with the UK high street today. My very first job was at the Green Shield shop in Streatham. I started as a Saturday girl and continued to work there after I left school in 1974. I remember we were treated well, with Christmas bonus every year and the wages were good for the day. My first wage as a Saturday girl was £5. Hi everyone, I remember Green Shield Stamps, they were a life saver in my family. My mum exchanged them for an Iron, Kettle and Toys for our Birthday. I don't remember the large stamps as we only had £2 a week grocery money, and the shop keeper, measure and counted how much stamps according to spends. I have some green shield stamps and co-op stamps and wondered if there is a charity or someone would like them before we recycle them.